Here are 9 DIY fine motor skill activities for preschoolers. I think it's important to mention here that kids this age don't have a very long attention span, so try not to expect them to stay on task very long. An educator recently told me that you allow one minute per year of how old they are. For example, a three year old might stay on a task for three minutes. If the task is something such as painting, you could add an extra minute. Anything over that and if the child is still going then you are a very lucky parent! Woolworths have brought out a fantastic collection of dominoes that you can collect when you do your shopping. Technically we don't have the entire set but it doesn't mean with can't do a lot with it. In fact, I have devised six games we can play with them. 1. Match the tiles. With all the tiles facing up, ask the child to put together the characters that are the same. 2. Memory. With all your doubles, face them down and mix them up. 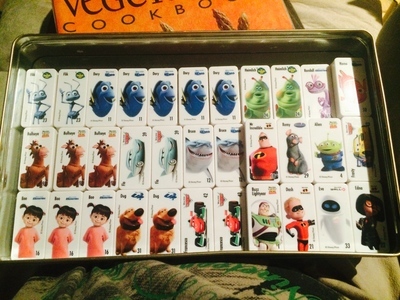 Have the child lift a tile at a time and try to match the characters. 3. Practice counting using the dots on the dominoes. Depending on how advanced the child is you could consider getting them to put the dominoes in numerical order. 5. Stacking, building and knocking down the tiles, similar to how they might use lego. Container with a designated colour on it. Pick up one of the pegs and attach it to it's matching colour container. This sounds very basic but its a skill they will need in school so why not get them to start practicing now? The action of cutting believe it or not, actually engages their core. Weird right? The first step is just your basic cutting action and getting the the scissors up the right way. The second step is where you can draw lines for them to cut along and then curves, shapes and so on. This one requires some coordination and definitely some demonstration initially but once they get the hang of it they love it! 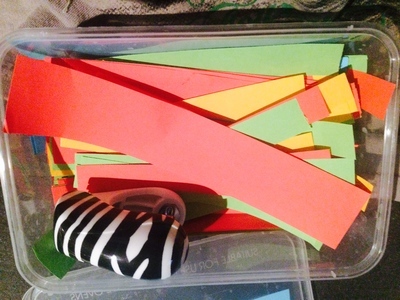 I keep strips of different coloured paper and mini kids size stapler in the container for J to get out when he wants to. Curl the paper so that both ends meet and staple. Repeat the same again except curl the paper through the first one. Have the child pick out the popsticks from the mixed up pile and sort into the appropriate container. To up the challenge you could ask them to stack the popsticks flat on top of each other. This can be harder than you would think for little fingers. Sticker activity books are great and they can keep them very busy if they are peeling and sticking stickers! I like to also cut up squares of coloured paper for J to wipe the glue over and stick on a piece of white paper. It can be very challenging depending on what you put on there. You can also buy a version like the one pictured here where you actually sort the toys into coloured bowls. Using tongs get child to pick up object and move over to the other tray without dropping it. Getting them familiar with pens, pencils, crayons etc before starting school is a good idea. Don't expect them to make works of art but just perfecting the basic skills of drawing lines, curves and progressing on to shapes or more is a fantastic start. Try to teach them from the get go the correct way to hold the medium ( pen or crayon) it will be much harder to try to undo a bad habit later. I draw lines and shapes on a piece of paper in black text and J traces over them with his crayon. I also draw something such as a circle and then ask him to copy it on his piece of paper. This one definitely requires concentration! You could also use pasta shells if you didn't have any straws handy. If you want to challenge them you could get them to thread specific colours or colour sequences. It all depends on your child's age and ability.